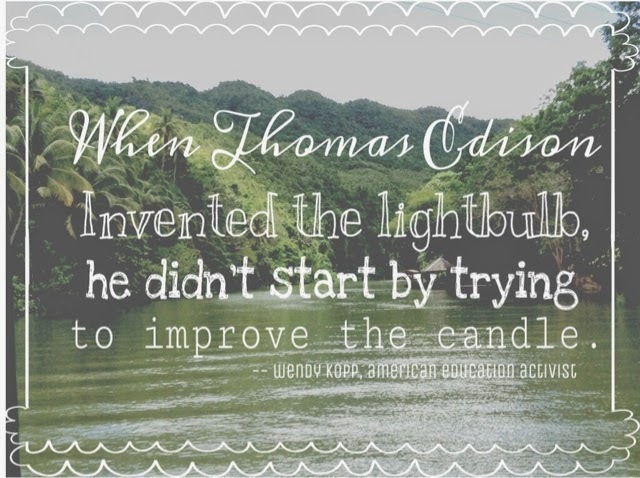 When Thomas Edison invented the light bulb, he didn’t start by trying to improve the candle. After two months of hiatus, I am slowly coming back. I hope to continue blogging again. The months of hiatus were something to connect with the quote above. Yes, huge changes were coming into my life. First of all, I resigned from my previous job. Then, few days after rendering, I was working again to a new environment. It was different field of work for me. To a web and graphic designer, now I am a software analyst. It took me a lot of courage to do this. I was in doubt at first, if I could take a huge risk. But this quote inspired me to take a deep breath and follow my heart desires. It is been a while since I have thinking and looking for growth and changes with my career path. Before everything else, one day I felt depressed so I went to the church to pray and to ask for guidance to God. That day, believe it or not, He replied. When I was sitting after my prayer, an old lady went to me. She put a sign of the cross on my forehead and said, “Jesus loves you. You will receive a miracle today.” Then, she left. I really felt the presence of the Lord. I was sobbing badly like a little child lost. Days went by, blessings was pouring unexpectedly. Fast forward to now, changes happened quickly but I am glad I made it. Happiness. No regrets.